all around the Area and other parts of the country. With a total of (72) seventy two players, they were made up of (50) Men & (22) Ladies, which is good to see on such a great day weather wise, where as the high standard of play by the players inside must have been reflected by the day outside. While on that note, just a wee tail about Cody Harris the eventual winner. As the story goes, Cody had arranged to go fishing the morning of the Tournament but this was never going to happen because he slept in, so instead being out on the water catching a fish, Cody was in a club making some money, that's Talent!! Mark McGrath of West Coast N.I. 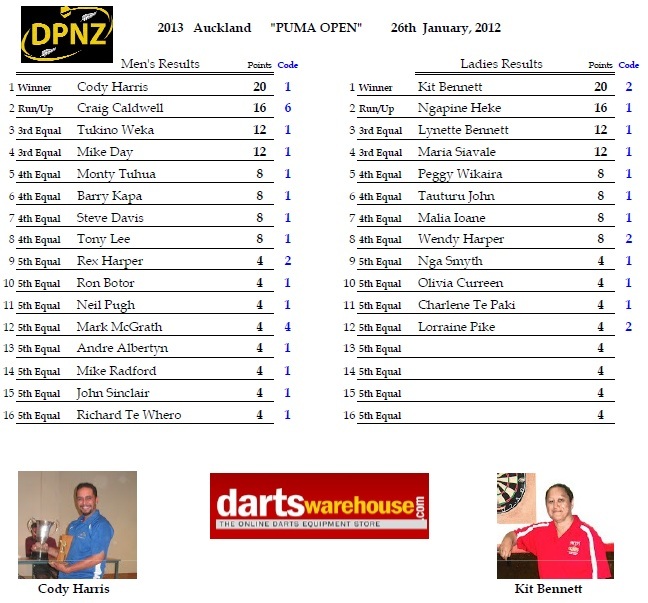 lost to Tukina Weko of Auckland / Andre Albertyn of Auckland lost to Craig Caldwell of Wellington /Mike Radford of Auckland lost to Steve Davis of Auckland / John Sinclair of Auckland lost to Tony Lee of Auckland / Richard Te Whero of Auckland lost to Mike Day of Auckland. Cody's winning legs were 16,17,17,21 and 18 giving him an overall average of 80.07. Tukina's three winning legs were 15,25 and 19 giving him an average of 76.42.
old age problem that Mike had at times was where did my double's go when I needed one. Mike's winning legs were 22,20,14 and 16 giving him an average of 83.50. The final between Cody & Craig produced once again a high standard of darts, although by this time Cody Harris seemed to find another gear, and walk away with a 6 to 2 win. Cody's winning legs were 19,21,16,17,21 and 18 darts with an average of 80.51, Craig's two winning legs gave him an average of 77.07. 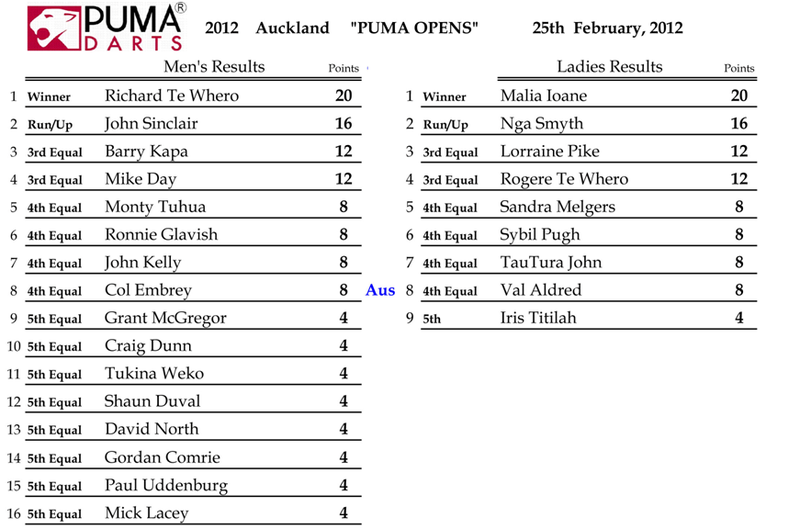 Auckland / Malia Ioane of Auckland lost to Maria Siavale of Auckland /Wendy harper of Waikato lost to Kit Bennett of Waikato. 5 /4, the second game between Lynette Bennett and Ngapine Heke seemed to be a one sided affair, rolling out to a 5 / 1 in favour of Ngapine. Kit seemed to have another agenda, defeating Ngapine 6 to 1.